We make managing your pets health care easy. From scheduling an appointment to paying your bill, these easy-to-use-tools make managing your pets health care a breeze. At Home’s patient portal puts all of your pets health information in one location, making it easy to view test results, contact your veterinarian, schedule and change appointments online and more. Note: Billing is not available through this tool, and some appointments, including those with specialty doctors, must be made directly by calling the hospital. You can schedule appointments online for routine visits such as annual exams, vaccinations, sick visits, follow-up rechecks and laboratory tests. 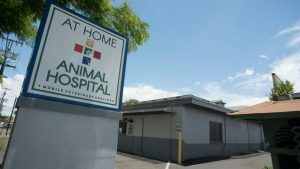 If your pet needs urgent medical attention or you need assistance please call now at (808) 873-0102. Advanced medical attention and specialty care appointments need to be schedule over the phone at (808) 873-0102. Our staff will help you book an appointment and answer any questions you may have. Looking for a specific form? To help you better prepare for your pet’s upcoming veterinarian appointment, pet boarding stay or airport release, we’ve made several common patient forms available for you. 3. When unexpected illness strikes a pet, unexpected expense strikes as well. At Home Animal Hospital understands this and is able to make some special arrangements through the CareCredit program. It takes just 5 minutes to complete an application. You can either apply at our hospital, where we’ll call in your application over the phone for immediate approval, or apply yourself online at: www.CareCredit.com.